Our Spring 2019 newsletter is now available to view by clicking on the link below or selecting the "Practice Newsletter" tab at the left hand side of this screen. We will reopen on Tuesday 23rd April and Tuesday 7th May at 08:00. If you require medical assistance during this period, you should contact NHS 24 on 111 to discuss your symptoms. If you feel you require emergency medical attention, you should dial 999 and request the ambulance service. Dr MacKintosh will be retiring from the practice during the month of September 2019 for health reasons following 28 years of dedicated service to Tayview Medical Practice. We know Dr MacKintosh will be missed by a large number of our patients and we would like to wish Dr MacKintosh best wishes for his retirement. As a practice providing services across two locations (Newport and Tayport), we are finding it increasingly difficult to sustain services at our Tayport practice. This is especially difficult in the later part of the day when there has often been no GP coverage available for our Tayport site. This results in our staff working alone at Tayport which is an unsustainable position for our staff who we have a duty of care to ensure their personal safety is assured. Furthermore, the practice currently has a reduction in GP appointments which equates to 1 full time GP. This will be compounded further from September 2019 with the retirement of another full time GP. Unfortunately, despite repeated requests for locum assistance, the practice is finding it increasingly challenging to fill the reduction in GP appointments. Given the above, the doctors have taken the difficult decision to reduce the opening hours of our Tayport practice. From Monday 3rd June 2019, our Tayport opening hours will be Monday to Friday 08:00 - 12:00. Please click on the links below to obtain further information. Current medical evidence shows that ear irrigation can lead to ear infections, perforated ear drums and/or tinnitus (persistent noise). For this reason, Tayview Medical Practice will cease to provide an ear irrigation services from April 2019. Patients who require their ears irrigated prior to attending an audiology appointment will be referred, internally, by the audiology department for micro-suctioning. Please click the link below which will provide you with self-care guidelines for managing your symptoms. Please note, any incoming or outgoing calls may be recorded by the practice. The General Data Protection Regulations (GDPR) is a new law that determines how your personal data is processed, kept safe and also advises you of the legal rights you have in relation to your own data. The regulation applies from 25th May 2018. These regulations will supersede the Data Protection Act. It is similar to the Data Protection Act (which the practice already complies with) but strengthens many of the DPA’s principles. Please click on the links below to find out more information regarding how the practice processes your personal data and what GDPR will mean for you. Welcome to Tayview Medical Practice. 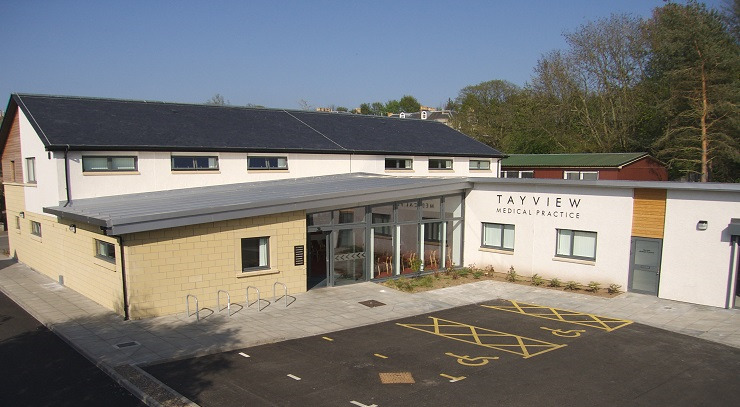 The doctors and staff of Tayview aim to provide you with a very high standard of patient care. In order to achieve this aim, we provide a number of clinics for the management of chronic diseases and offer a variety of appointment options which include pre-bookable appointments, online appointments, on the day appointments and emergency appointments. We also offer a wide variety of other medical services, details of which can be found under the "Our Services" tab at the top of this page. We provide general medical services from two medical practices at both Newport-On-Tay and Tayport. The addresses for both surgeries can be found under the "Contact Details" tab at the top of this page. Our present Tayport surgery opened in 1996, having previously operated from converted cottages, with our Newport surgery opening in 2006. You will also find useful information contained under the "Further Information" section to the right of this page. We are a long, established, training practice for medical students and have close links with both the Universities of Dundee and St. Andrews. We are happy to receive feedback from our patients in order to help improve our service to you. Feedback can be provided by using our comments/suggestions forms which can be found at both practice reception areas. We offer a variety of IT systems available to help improve patient access. These systems include a 24/7 appointment telephone line which allows you to book an appointment with any GP, over the telephone, at any time. We also offer the facility of being able to arrange online appointments and request your repeat medication online too. You must register to use these services and a receptionist will be able to assist you further with this. We also offer all patients a text reminder service to remind them of any appointment booked. Newport Surgery has parking spaces for the disabled and automatic doors. Tayport Surgery has a parking space for the disabled and automatic doors. On both sites, all patient services are provided at ground floor level and are accessible for disabled person. However, if you require assistance please ask any member of staff who will be happy to help. Are now available in the practice. Please ask at reception. P13 and P675 only. Please contact Ninewells Hospital Department for any other type required. The practice has a list of Interpreters with the Fife Community Interpreting Service. Patients requiring the services of an interpreter should contact the practice directly. Keep up-to-date with news about the practice by downloading a copy of our quarterly newsletter. Copies can be found by clicking on the "Practice Newsletter" tab which can be found under the "Further Information" heading at the right side of this page.